Early morning is the best time to water vegetable and flower gardens, before the hot sun hits them. Water deeply and infrequently. Wet foliage overnight makes plants more susceptible to fungus and disease. The amount of water that your garden will need is going to depend on the weather conditions in your area. The primary rule of summer watering is to water thoroughly and deeply each time and to allow the soil dry out between waterings. Deep watering will allow the plant's roots to grow deeper, where they are less likely to dry out. Light, surface watering wastes water and is harmful to plants because the water never reaches the root zone of the plant, and the moisture rapidly evaporates from the top inch of soil. The best way to tell if your plants are receiving enough water is to take a trowel or shovel and dig down a few inches. The soil should be moist at least 3 or 4 inches deep to insure that the water is reaching the root zone of the plants. If you planted drought resistant plants in your garden, you won't have to water as often, but the principal of deep watering still applies. As the temperatures rise, your container plants may need daily watering, especially if the pots are exposed to the drying sunlight. Push your finger into the soil in your container plantings at least once a day (more often on hot, dry days) to feel for moisture and be certain that plants are getting enough water. Apply water until it runs out the drainage holes. Hanging baskets of flowers or vegetable plantings need careful attention to watering and feeding during extended periods of hot weather. Last chance to plant summer bulbs (caladiums, cannas, gladiolus, etc). Plant container-grown perennials and summer annuals. Fertilize and water regularly - especially container gardens. Dig spring bulbs when tops have died down; divide and store or replant. Stake tall-growing flowering plants such as delphinium, hollyhocks, and lupine. Continue to dead head (remove dead flowers) your annuals to encourage continued blooming. If your annuals have died off, pull them out and add them to the compost pile. Replant that spot with hardy annuals or perennials, such as Pansies, Calendulas, or Armeria. Get a second bloom from faded annuals by cutting them back by one half their height, then fertilize them with a liquid 5-10-10 fertilizer. Roses will need to be fertilized each month through the summer. In colder areas, allow shrub roses to ripen by discontinuing feeding them at the end of the month. Chrysanthemums should be lightly fertilized every two weeks. 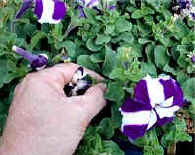 Discontinue pinching your mums in mid month so they will be able to develop flower buds for the fall. To promote 'trophy size' flowers, allow only one or two main shoots to develop. Remove all side buds as they begin to develop. To produce the largest Dahlia flowers (especially 'Dinner plate' Dahlias), the main stems should be kept free of side shoots, allowing only the main terminal bud to develop. Be sure to provide adequate support to prevent wind damage. Bearded Iris may be divided and replanted when they have finished blooming. Discard all shriveled and diseased parts. Sweet peas may tend to fizzle out with the hot summer weather, but with heavy mulching to keep the roots cool and moist you can prolong the flowering season by a few more weeks. A little mid-day shade will also help to maintain the quality of the flowers and prolong the blooming season. Verbenas, Euonymus, Pachysandra, Ivy, and climbing roses are some of plants that will root fairly quickly by layering them into the warm soil. Fasten a section of the stem containing one or more "eyes" down onto cultivated soil with a horseshoe shaped piece of wire and cover it with additional soil. By summers end, the stem should be rooted sufficiently to sever it from the parent plant and replant into another area of the garden. Sow seeds of Hollyhocks, English daisies, Foxgloves, Violas, Canterbury bells, and Sweet William into the garden now for next year's bloom. Geranium cuttings may be made in late July to start plants for indoor bloom during the winter months, and for setting into the garden next spring. You may need to provide supplemental lighting with fluorescent grow lights for really good winter blooms indoors. Mulch plants to help retain moisture. Control powdery mildew with fungicide. Water newly planted shrubs during dry periods. Summer blooming shrubs should be pruned for shape after they have finished flowering. Remove any dead or diseased branches. Fertilize flowering shrubs like Rhododendrons, Camellias and Azaleas immediately after they have finished flowering with a 'Rhododendron' or 'Evergreen' type fertilizer. Dead head the developing seed pods from your Rhododendrons and Azaleas to improve next years bloom. Be careful not to damage next years buds which may be hidden just below the pod. Apply insecticides to control spittle bugs, grubworms, and fire ants. Lawns need at lease one inch per week. If a water shortage is expected, or you hate tending to grass, you may choose to just let your lawn go dormant, and water it as seldom as once a month. Raise the cutting height of the mower. Taller grass cools the roots and helps to keep the moisture in the soil longer. Avoid using fertilizers in hot, dry weather. House plants can be moved outside to a shady, protected spot. Continue to watch for insect or disease damage and take the necessary steps to control the problem. Warmer weather means it will be necessary to water and mist your house plants more often, as will drier air in air-conditioned homes. Feed your house plants with 1/2 the recommended strength of a good soluble house plant fertilizer while they are actively growing. Change humming bird "nectar" regularly. Plant annuals, perennials and shrubs that attract birds and butterflies. Provide a water source and clean and replace water daily or more often in heat waves. Keep your feeders full - second broods are fledging now, and third broods are starting. Last chance to plant summer vegetables-squash, cucumber, tomatoes, pepper, peas, beans, pumpkin. Midsummer plantings of beets, bush beans, carrots, cauliflower, broccoli, lettuce, kale, and peas will provide fall and winter crops. Begin enjoying the harvest of your homegrown fruits, vegetables and herbs! Fertilize June bearing strawberries after the harvest, and ever-bearing varieties half way through the season. Plant out successions of salad crops for continued harvesting throughout the summer. Sow seeds for cool-season crops directly into the garden by mid-July. Continue to protect your fruit from the birds with netting. Empty areas of the garden, where the crops have finished, should be replanted with either a fall vegetable crop, or a cover crop of clover or vetch to help control weeds. Cover crops can be tilled into the soil later, to add humus and nitrates to the soil. Cover blueberry bushes with netting to keep birds from eating all the crop. On staked tomatoes, keep removing suckers. Watch for fungus infections (prune for air circulation, pick off affected leaves, treat with approved fungicide). Check leafy vegetables for caterpillars and leaf-eaters. Control with Bacillus thuringiensis or Sevin. Never use Sevin during bloom period or in the presence of bees. Mound soil up around base of potatoes, gather and eat a few "new" potatoes from each hill. Weed and fertilize rhubarb and asparagus beds, water deeply to develop crowns for next year. A mulch of compost or rotted cow manure works well. Place traps to catch adult apple maggot flies. You can use pheromone traps to monitor presence of pests. 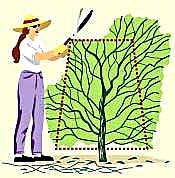 Spray filbert trees for filbertworm. Spray peach and plum trees for root borers, fungi. Third spray for codling moth and fungus diseases in apple and pear trees. Be alert to slug and snail and insect damage. Some of these creatures will be hiding during the heat of the day, but will come out of hiding in the cool morning and evening hours or after a rain. Seek and destroy adults and their eggs. Keep the weeds pulled, before they have a chance to flower and go to seed again. Otherwise, you will be fighting newly germinated weed seed for the next several years. Change the water in your bird bath regularly, and keep it filled. Standing water may become a breeding ground for mosquito larvae. Continue to watch for insect or disease damage throughout the garden, and take the necessary steps to control the problem.